I have 3 "pins" that are placed within a div (#outerdiv). The div has a background-image and the pins should be on the same spot on the background image at all the times when resizing window. It works with #pin1, but not with #pin2 and #pin3 (which uses the same code). The only difference is that #pin1 is first in the html. 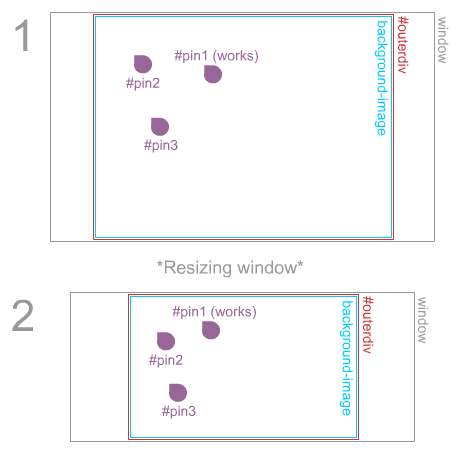 When resizing window, #pin1 works perfectly (is on the same spot on the background image). However, #pin2 and #pin3 and every other after that, is pushed a bit downwards and therefore not on the same spot anymore. However, it is still on the right horizontal axis. updateProductBg() is used for making #outerdiv the same exact size as background-image. If you want to try it out yourself, change the 2600 and 1450 with your width and height of image. .pin is currently set to position: relative; this means top and left will offset the pin from where it painted on the page. To place them relatively to #outerdiv you need to make them position: absolute;. In your original version #pin1 works because it is output at the top left corner of #outerdiv before it is moved. The other two are positioned incorrectly because their position has been effected by the pins placed before them.